Verizon will put a peel-off sticker on the screen of cellphones it sells, warning that the user's location may be tracked. 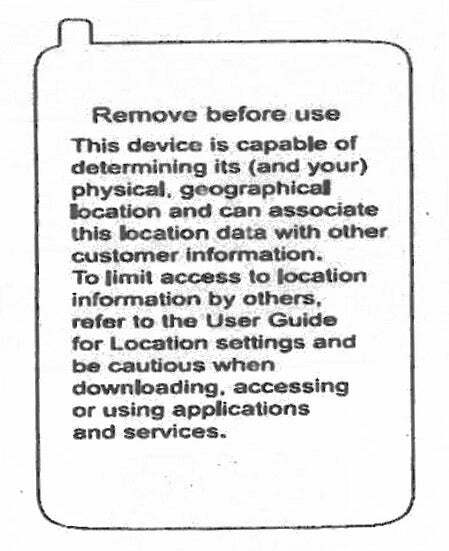 The sticker also advises users to be careful which apps they install if they wish to avoid location information being shared with third parties. The move isn't in response to the recent location-tracking scandal surrounding Apple iPhone and Google Android phones; it's a Verizon initiative that has been planned for some time. It was revealed in a written response from Verizon to the House Bipartisan Privacy Caucus (PDF link), which had written to the four major mobile companies last month after learning that a German mobile operator tracked users' locations. Verizon also revealed that it holds personally identifying data, including location details, for up to seven years. This in itself is astonishing. Do you know where you were on, say, Nov. 21, 2008? Verizon does, if you were using one of its handsets equipped with GPS, such as the popular Samsung Omnia or BlackBerry Storm phones, released around that time. Of the other mobile carriers, AT&T says it'll hold location data for anywhere from a few days to five years, while Sprint says it'll hold it for five years. T-Mobile would only say it "retains personal information for only as long as we have a business need, or as applicable laws, regulations or government orders require." The discovery that the iPhone tracks user locations in a system file has brought forth a storm of protest from users as well as politicians, who have suddenly peeked behind the magic curtain and realized that cellphones are essentially tracking devices that we willingly carry with us wherever we go. Users have three bogeymen to fear: mobile carriers that track users via cellphone towers and/or GPS information; cellphone manufacturers that use GPS functions built in to the operating system to track users; and third-party app makers that use location information as part of their service but who might also retain the information for other purposes. The good news is that lawmakers are starting to get a grip on the situation, with Senator Al Franken of Minnesota boasting Thursday that representatives from both Apple and Google will testify at a congressional hearing next month on consumer privacy and smartphones. Whether this will lead to legislation is another matter. For the moment at least, users should pay close attention to end-user license agreements, particularly when installing new apps, and also regularly check their handset settings to ensure their phone is keeping their location private.